The Classical Theater of Harlem has granted New York City a great opportunity to experience Shakespeare right in the heart of Harlem. Producing artistic director Ty Jones and managing director David Roberts brings one of the most famous stage plays, Romeo and Juliet to Marcus Garvey Park. A story of who young lovers who had to hide their relationship because of the unspoken differences between their two houses. The Classical Theater of Harlem added their own style to the classic Shakespeare play, hip-hop music at the beginning of the play, dancing between scenes, and the costumes fit the surrounding urban area of New York City. The producers and directors made sure they kept the integrity of the play by keeping original dialogue and plot. However it was the minute changes that were the most intriguing. 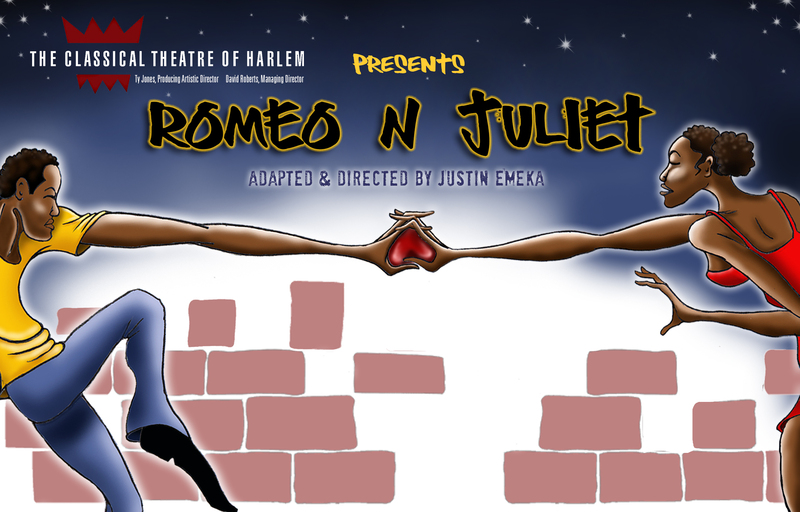 In the original Romeo and Juliet play the family feud between the Montague and the Capulet was never fully explained but in this adaptation by the Classical Theater of Harlem, the Montague family were African Americans that lived in the neighborhood and were under constant threat to violence. The Capulet family were Caribbean Americans that were well off and that preferred to stick together. The dialects and clothing of both families helped differentiate who was apart of each family and also helped the audience make inferences to why these two houses were feuding in the first place. Performing in an urban version of Romeo and Juliet, the actors had a task of making the story relate to the surrounding area, they did this seamlessly. The actors, while still using original lines, used there own personal mannerisms and facial expressions to convey what they were talking about. This made the experience even more fun, now a person watching was able to catch jokes that were difficult to understand in the original play. The play ran straight through to the end with no intermissions, however, during the transitions between scenes there were hip-hop or reggae performances to keep the audience’s attention glued to the outside stage. While watching the performance there were real police sirens going off outside but the actors took the noise in stride and did not let the outside distractions affect the play. Performing Shakespeare outside has its challenges as actor,Jason Delane,stated after the play “we have to compete against the outside elements.” During the opening show on July 5th during the play there were fireworks going off in Marcus Garvey park, but the play went on without any breaks. The unbreakable focus the actors show keep the audience intrigued through-out the entire play. The stage added a modern feel to Romeo and Juliet, there were graffiti on the walls and that made the set look like a neighborhood in Harlem. This only tightened the connection between the audience and the actors. The directors did a great job in making the play relatable to the outside surrounding area. Instead of weapons like swords like the original play, the actors used pocket knives and hand guns to fight each other. From the very first scene, the directors set forth a plan to catch the attention of everyone in the audience. The play opened up with people outside dancing, children playing and some just hanging out, a regular summer day in the neighborhood. Then violence erupted when sides were drawn between the people dancing; pushing and shoving followed and out of nowhere a loud gun shot went off. Everyone on the stage hit the floor, normal protocol in a rough neighborhood and you hear a gun shot. Everyone on stage got up except one, a little girl who was jumping rope. This foreshadowed the underlying message of Romeo and Juliet, that the violence from both houses Montague and Capulet would not only destroy themselves but everyone around them. A few of the actors, Clark Harris(Montague), Dorcas Sowunmi (Lady Capulet), Keldrick Crowder (Prince), and Jason Delane(Lord Capulet) all discussed the sense of responsibility they have by bringing Shakespeare to the community of Harlem for free and perform a world famous play in front of people who are not always able to afford a broadway ticket. The Classical Theater of Harlem has done the community a justice by brining culture and art back to the mecca, now it is up to the residents of Harlem to help make these plays in Marcus Garvey park an annul event. My name is Malcom X. Bowser, a history major at SUNY Old Westbury who aspires to have a future in journalism.